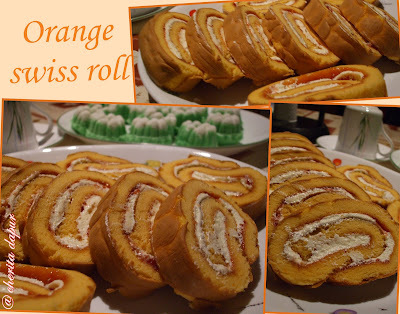 This swiss roll recipe was requested by kak Aniza... and to kak Ja, this is the cake that I told you about yesterday... The cake was so soft and spongy... Everybody will love it... The recipe was from Mak Lang Azie's fp and Mama Fami's fp.. Thanks so much.. To kak Aniza, I doubled the recipe for the cake above... Those photos were taken at kak Aniza's house..Thanks kak Aniza..dapatlah tayang cawan Correl baru akak kan...hehehe..
Preheat oven at 180 C (depends on your oven ~ mine is 170C). In a mixing bowl, add all the ingredients A thoroughly. Beat on high speed for 5-7 minutes. (Don't over beat). Fold in the melted butter. Mix well. Spread the batter onto the tray layered with greaseproof paper. Bake in the preheated oven for 20 minutes. (Don't overbake). Once baked, remove the cake from the tray on to a wire rack. Let it cool. Turn the cake on to another piece of paper and remove the greaseproof paper. Spread it with a layer of jam and then with the buttercream. Slowly and carefully, roll the cake. Wrap in a clingfilm and keep the swiss roll in the refrigerator for the buttercream to set before slicing it.